In general, people like to find, in stores, or receive as a gift, personalized items with their names on them. Those who, however, have unusual names or different spellings do not often have this luxury. But it's not that bad. However, in some situations, a custom object can make a huge difference to the person who receives it. That's what Amy Jandrisevits understood. Amy realized how difficult it was to make a child understand how beautiful he or she is, if the child never sees himself in anything that is supposed to be like her. This is how she started making non-traditional Raggedy Ann rag dolls. When parents started hearing about what she was doing, they started asking her to meet the needs of the specific differences that made their children so special. Four years later, doll making became Amy's mission and she did it under the name "A Doll Like Me". So far, she has made about 300 dolls and her waiting list never seems to end. 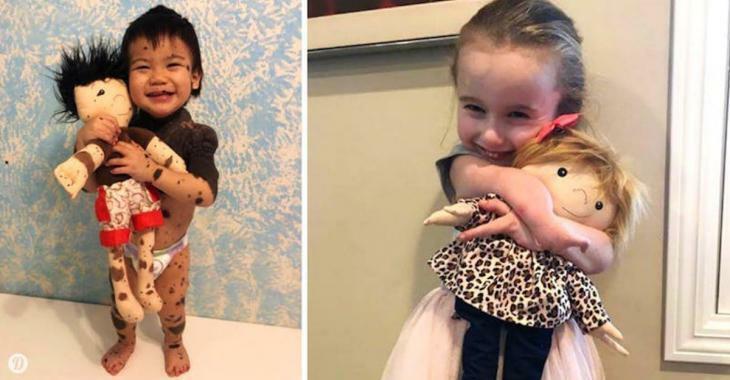 Each doll costs about $100, but seeing how excited each child is to finally have a doll that looks just like them is priceless. For this reason, Amy is committed to finding a way to cover costs herself when parents cannot afford to shell out the $100. She launched a GoFundMe campaign to get there. In addition to paying the dolls' shipping and material costs, the funds she gets will turn A Doll Like Me into an official non-profit organization. She has already partnered with a children's hospital to identify children who could benefit from a doll they can truly adopt. And it seems that people are really responding to her mission because she has already raised nearly $23,000 of her initial $25,000 goal. The ultimate goal is to provide these dolls without families having to pay for something so essential to the well-being of their children. "If we truly want to see that mental health is a necessary part of medical care, that's the key. If you want validation and play therapy, you need these dolls," she explained. Amy makes dolls that take into account ethnicity, differences between limbs, marks on the body, and other health considerations. She also wants to create it in accordance to the interests of the children. On Amy's Facebook profile, we learn that she found herself learning how to make different types of dolls alone. At first, she made dolls with different limbs, and she found out how to integrate the differences between the hands, albinism, birthmarks and burn scars. Now, she takes on all the potential differences she might encounter by saying, "If it's something I can do, I'm willing to try. " Navigating the Facebook page "A Doll Like Me" is to admire several first heartwarming encounters between these little ones and their dolls. As Amy said in a social media post, there is a story behind each of these dolls, but she generally prefers to let the images tell the stories themselves. What an admirable and inspiring project! Maybe craftsmen from everywhere could follow this example and create dolls or games adapted to all these brave children in our hospitals?